As we all know, today 15th September 2017 marks the beginning of the real Operation Python Dance in Abia state, a soldier who pleads anonymous have revealed that it was a request from the south east governors from the federal government which is a concrete plan from them to put fears in the life of IPOB agitators but little did they know that the Cabals in Buhari government have been looking for a loophole for them to penetrate the home of Nnamdi Kanu to Assassinate him because of the so many truth he have revealed to the world about them of which the latest was the unveiling of the man in Aso Rock as Aminu Jibrin from Sudan. At first the governors wanted the operation to start from Anambara which is also a major hub where IPOB activities takes place and comprising that it's 18th November election is under threat but Willie Obiano declined it saying that the atmosphere in Anambara have been very intense sighting the Ozubulu terror attack and other horrible incidents that have been facing the state, after so many deliberations, Okezie Ikpeazu agreed to take the exercise to his own state (Abia) having been compelled to do so with reason that his state houses the agitation. 82 division Enugu was assigned to spearhead the exercise because it was in her jurisdiction to do so but the cabals thought it wise to bring inn soldiers from the north to mix with the other Hausa soldiers that are in 82 division so as to curb sympathy with little number of South South and South East soldiers to accompany them so as not to seem partial. 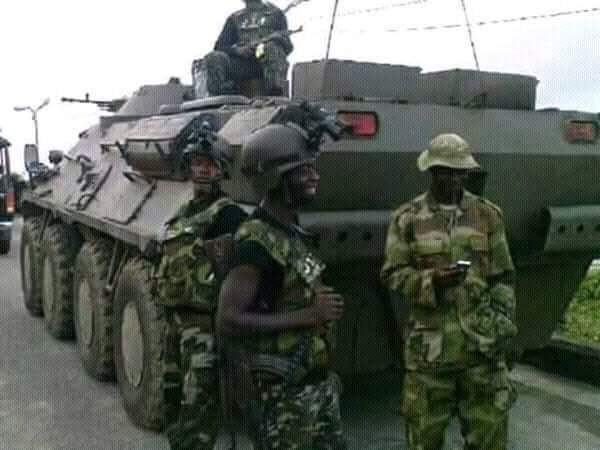 As alarm of the influx of heavy military hardware broke out, the tension was high already before our arrival, the South East and South South soldiers were left at the barracks to attend to some assignments given to them by the commanding officer of the python dance and Show of force. The soldiers who have the real message for the purpose of the assignment were deployed to all streets of Aba and Umuahia respectively whereas others moved to capture the leader of IPOB but were supprised that the youths have no shred of fear in them even while they shot them with live bullets, so in other not to act foolishly, we retreated to prepare for the final show off but to the surprise of all of us, before night fall, the video of maltreatment against those coming from Aba to the house of the IPOB leader had surfaced and it threw a very big quarrel among us because there was no other tribe apart from Fulani soldiers that embarked to the assignment. So the commander of the python dance resolved that we must leave our phones behind while going for the exercise sighting that someone among us may have been sympathetic to the infidels and that was why there could not be any other video evidence to show the world of the evil act that was committed against a peaceful people of the land. Amidst rain of bullets in the building we entered the building and many were already dead but we proceeded to the house to capture those who were still alive including the father of the IPOB leader. In fact there many there things to say but the truth of everything is that your selfish governors opened the door and the Cabals have vowed to kill Nnamdi Kanu before giving peace a chance.